Good morning friends. This past week has been quite a ride for me here in "computer world" the ups and downs were to scale down even the nastiest coaster ride. Wednesday morning my PC crashed. I could not get anything to work. A day later I was advised to replace the 10 year old machine and I promptly did so. Once in operation I was now facing the loss of all my photos and everything else associated with my history on the old computer. Several days of trial and error I've managed to get some of my "stuff" back. I was told that the "New" systems are as simple as can be, but I'm not convinced. Still I'm making progress and should be able to post a an actual fly fishing related story soon. I ask that you be patient and keep your fingers crossed. Thanks, Alan. While going through Smiths book The North Country Fly I came across several interesting patterns, one of them is probably not well known to most of us but looks to be a fly that will get the job done. Again the simplicity of the pattern is key along with it's sparseness. The fly is called "Dixon's Tangerine".. and was first tied somewhere between the 1950's to the 1980's. The fly is tied with Red Pearsall's Silk..Thorax, Peacock Herl...Hackle, Brown Owl. I used Starling. This fly comes from the James Blades' list of flies circa 1890...again not a fly found in most fly shops. The pattern is called "July Dun"....White Pearsall's Silk...Thorax, Peacock Herl...Hackle Starling. Yesterday morning's forecast called for cloudy skies giving way to some breaks of sun. With that info I felt I had a few hours of good fishing and be back at home before eleven. As I was driving to the stream I felt pretty good about my chances of finding some willing natives. I geared up and was on the water in very short order. Fishing the little pockets I managed to bring several guys to the surface but without a hookup. About a half hour in the stream the sun broke out and the stream was lit up like a Broadway play. I continued to fish trying to find some shady areas but not a single taker. I had a choice, leave and go home or fish and enjoy the beauty which abounds the streams this time of year....I chose the latter and what a beautiful choice it was. Renewing, I wondered where these seeds would land. I tell you I fished every likely looking spot. I came to this place, the water was flowing and causing a thin riffle. It then broke into a deep pool that had some pretty good sized sunken logs. There was some shade along with a slight whirlpool. I cast my fly and let it drift, it hung up slightly on the gravel of the riffle. I pulled it to free it and a brookie darted for the fly. No hookup. The next drift found the fly moving toward the log jam. A lightning fast swirl and a solid hookup. The fish was so strong, wanting to get to the log jam and freedom. I was able to convince him to come my way and he finally did. I could not believe the size of this wild native. He was perfect. A couple of photos and off he went. We have another meeting planned for this Autumn. This is a brook trout fly, a fly that will find and bring to hand. It's a pain to tie but well worth the effort. Summer has been in full swing in these parts. My fishing has been limited to a few hours in the morning and the times when I'm not about the streams our time is spent with Parker our grand-dog. Parker is here for a couple of weeks while his first family is away on vacation. But he's not missing them for his time here has been dog paradise. Walking , swimming and home cooked meals. Today we may even get in a hot dog roast along some waterway. We have had an awful bout with gypsy moths. The eastern part of the state taking the brunt. Some of the trees have been totally defoliated and that is a problem especially for the brook trout who's streams have now lost there leaf cover. This may cause the streams to run warmer. I was encouraged when I saw this the other day. The trees are starting to regenerate. Young leaves have started to grow and show up on many of the trees. Thank you. Mothergoose Liverwurst. Man do I have a history with this culinary delight. The original maker of Mothergoose which was Tobin Packing Co. went out of business years ago but sold their recipe to another company. The product is the same. Is this stuff good. Sliced and spread on crackers, or in a sandwich it is so good. My favorite is to take a thick slice of liverwurst, along with a equal slice of raw onion and place it on a piece of rye bread, or raisin bread which is the way my brother Richard ate it. The North Pond Hermit....I picked up this book one night and read it cover to cover. It is well worth the read. Twenty seven years in the woods. The Tups Indispensable. I'm not sure how many of you fish this fly, or how many of you know about it. I sure it is one of those flies that is not readily found in fly shops, but a few online shops may have them. The original pattern is a dry fly but variations of wet versions are about and this is what this post is about. The idea behind this fly is somewhat unique in that it's name and partial material item is out of the ordinary. Here it is credit "Alan Shepherd" Australia. The Tups Indispensable Flymph. I prefer this version to the other one I tie which is below. This fly has great life like movement and has been a success on many outings. The Tups soft-hackle. This is another variation and one that seemed to be less favored in the times I've fished it. A result of the fish taking ability of the Tups Flymph. The fly when fished just below a riffle into some slack water can be deadly. Local, but not a native. This wild brown trout came to hand this morning. In only a few hours several more of his friends joined in, along with a native who was not ready for camera action and dropped the fly as the camera focused in on his wild beauty. Now this is native, and local. I have two farms that within a few miles of home. Sweet corn is available at both of them. These will be steamed and served with butter for supper tonight. Native tomatoes are a super favorite of mine. They are awesome in salads but they are equally as good as a sandwich. I like them sliced thin and piled high on a poppy seed roll. Native blueberries. These were picked this morning. Some for breakfast and some for desert tonight. And now the request. For the last 20 or so years my son and I have had access to a parcel of private land on which we were allowed to hunt deer. Two years ago the landowner passed on and we no longer are able to hunt the land. What I'm asking is that anyone who has a parcel of land of at least 20 acres and would allow hunting to contact me. I would like permission to hunt deer on your land. We are ethical hunters and respect all that surrounds the deer hunt. If you have or know of someone who would be willing to allow my son and I to hunt, please contact me Alan..at uppahdam@aol.com. Thanks in advance. I took some time yesterday to walk and fish a little stream in the hills of Connecticut. The stream flows through a large tract of state owned property, and solitude is a promise. What was to me a very special find was the fact that the stream was in such terrific shape. The flow was probably five times greater than it was last year at this time. I was excited to test my luck on some of the brook trout that swim these waters. The fly was to be a floater, one that would appeal to the natives as well as one that is highly visible. I'll let you name the fly. Today the trout were found in several places, from the head to the tail of pools, to the plunges and riffles. There were no mistakes to be made when casting the fly, for a strike could come from anywhere. Somewhere in the pool pictured above this wonderful wild jewel found the fly to much to resist. The stream is a gentile walk, with exception to the very large rocks that need to be negotiated from time to time. When I take a fish I feel the water for coolness, but the exact temperature is the fact that determines weather I continue to fish or leave. Today I'll stay....the streams waters were 58 to 60 degrees. I checked it in several locations. This is great seeing we are mid-July. I spooked a couple of brookies in this pool as I tried to walk past. They shot upstream and I knew where they went. Waiting some minutes I then dropped the fly and a split second later a rise and a hook-up. This gorgeous native was at hand, I admired it as the camera snapped...it was soon released. And as I sat momentarily I thought about how fortunate I was to have the pleasure of such an experience. When I mentioned solitude earlier, I did have some company. This little guy stopped to check out the goings on, satisfied he move on. With the proper amount of rain, all will remain well. Well Monday I took another stab at fishing the Farmington. My last visit was pretty good with the exception of high water. Just a note, I say high water and that's from my perspective, there's a great deal of anglers that would find flows as such to be just fine. As you can see the river was pushing some water and I was not attempting tossing a fly here, so I moved to several locations until I found some water that was more acceptable. Upon entering the river I glanced up and down looking for rises or any insect activity and what I found was nothing. The only things flying were moths and the only rise was a fellow snorkeling. In the next hour or so I fished several soft-hackles and streamers and received all "no thank yous" from the residents. 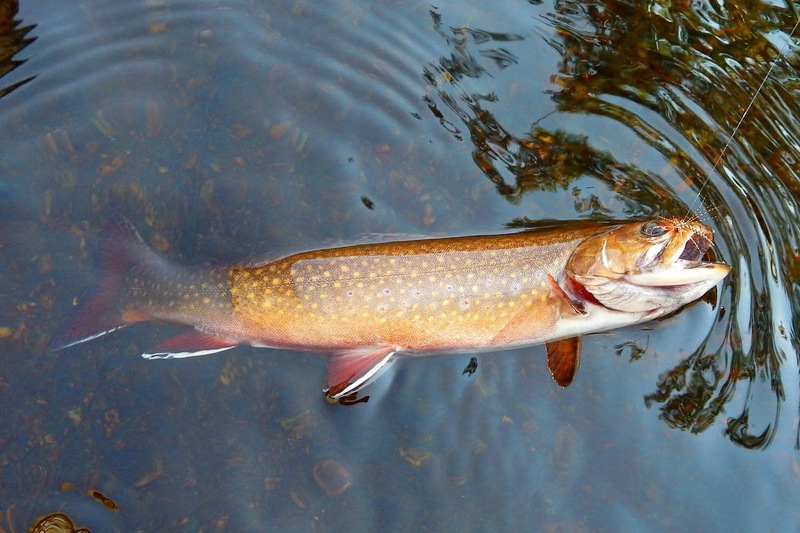 I tied on a Bomber and was soon tangling with some brook trout. These guys were all over that Bomber. Did I ever tell you how good a fly the Bomber is? Later in the morning I saw several of these. They look just like something I saw on the "X Files"
So after seeing one of Fox M's creatures I tied on a big dry. On the second drift this very strong lady rose an took the fly. She was strong and those head shakes I can still feel. The hook set held and soon I had the pleasure of taking her picture. The fly is not a creature from the X Files but a fly called the Cinberg from the Catskills. I was so excited to fish this stream at a time when there was a nice comfortable flow and there was no ice or snow to deal with. This stream I'm very familiar with but changes were made to it by the state. I first became aware of the changes last winter at a time that I could not fully fish the areas that were affected by the upgrade. The state had done some rehab work on the streams road crossing. The large culvert that was in place had been removed and a new one installed which enabled the wild brook trout to move freely through it and find much more suitable habitat up and down stream. The streams flow was perfect and there were many deep pockets that held fish. It did not take long to find a few willing combatants to bend the glass rod. I call this guy "spotty"...there were so many spots on this fish, they went from back to belly. I really love this run. Over the years it has given up some spectacular fish including a gorgeous spawning male that took a Black Ghost streamer. Unfortunately he was able to free himself before I could photograph him. Not bad......they were very active for a few hours and then they just shut down. Beautiful flora, it so nice to see it in a natural setting. Part of the days menu. Like I said before I have fished this stream so very many times, and this was the first time I saw this giant. I wish I had a tape measure. The rod was placed there to try to give some perspective. This tree is personal best for me as far as tree's go along this stream. The Grouse and Flash, a soft-hackle that can save the day. This fly is one to pull out when there are caddis about and when things are just slow it will bring a strike or two. It's simple to tie and can be used on various warm water species. Materials, Body, Medium Holographic Tinsel, I use silver, green, and pink. A bit of hares mask for a thorax. The hackle is Grouse 2-3 turns. This olive spider has been working well for me. Again the simplicity is the key to its success. Body, olive thread, thorax, sparse olive dubbing, hackle, 2 turns of hen. I believe we as fly fishers and fly tyers can agree that the featherwing Rangeley style of streamer is truly an American icon. It's origins came from New England, and the northeast. The concept of tying such an assortment of feathers is unique to this type of streamer fly. I have heard it said that the Rangeley streamer is an Atlantic salmon fly tied on a long shank hook. These beautiful and very effective fish takers are not prominent in fly shop bins. The tyers today that keep these flies in circulation and in the eyes of a new generation of fly tyers and fly fishers are to be commended. Below are a few of my streamers and one tied by my mentor. This fly which was created by Carrie Stevens, and tied by Phil Foster of Farmington Maine. He was a strong force in my life as far as tying these flies. These are two variations of western streamer. I tied these in the Rangeley style. Name for a special trout pond in Oquossoc Maine. I first tied this pattern many years ago, in my early days of fly tying. This is a lovely streamer named after a lady that is one of the best Rangeley streamer fly tyers.